Get the PSP strategy RPG next week. Summon Night 5 will launch for PSP in North America via the PlayStation Store on December 15 for $30.99, publisher Gaijinworks announced. Gaijinworks will mail out digital codes to users who purchased the limited quantity physical+digital version the day before release. As for when the physical version will ship to those who purchased it, Gaijinworks says it’s still waiting for the UMDs to complete production. When worlds collide and everything is turned upside-down, a new order be created to keep chaos at bay. 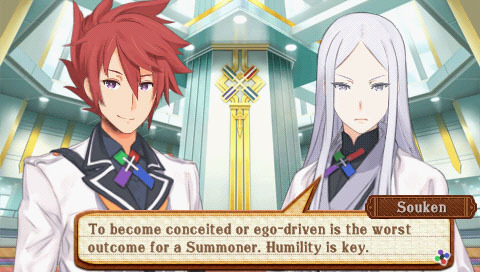 Bandai Namco’s Summon Night 5 is the continuing story of that order-keeping society, the Eucross, and the adventures their Summoners have keeping their world and the disparate races from the Otherworlds in balance. Players can choose to experience the story as rookie Summoners Folth or Arca, and one of four possible partners (their “Cross”), giving the game’s dialogue and feel a unique flavor on up to eight different playthroughs. What players see, and how the characters react depends on what characters are chosen at the beginning of each playthrough. But whatever choices a player makes, they’re in for a charming and sometimes tense Strategy-RPG adventure as they gradually unravel a plot that threatens the balance the Eucross is sworn to protect. The game features beautiful 2D and 3D art with battles presented in user-adjustable isometric perspective, and gorgeous animation that is a hallmark of Bandai Namco productions.